Free administration tools can really make a VMware administrator’s life easier, so when I heard that Vizioncore recently announced some free administration tools I thought I would check them out. 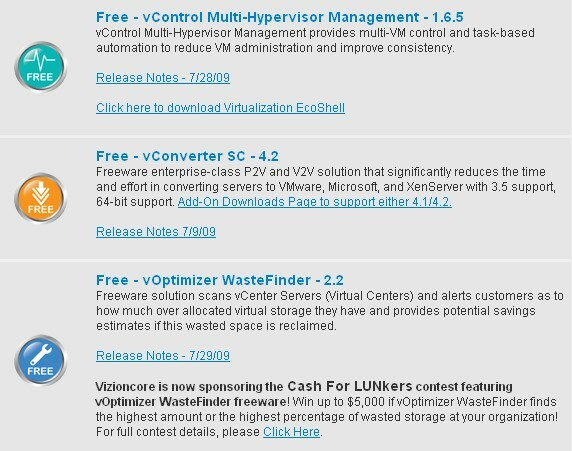 The three tools are vConverter SC, a physical-to-virtual (P2V) and virtual-to-virtual (V2V) conversion tool; vControl, a multi-hypervisor workflow-based management console; and vOptimizer Wastefinder, a disk space and alignment reporting tool. The first tool, vConverter SC (SC stands for server consolidation) is based on the full version of vConverter but lacks the continuous protection feature (recurring P2V replication) of the full version. VConverter SC is a powerful tool that rivals VMware Converter but has some additional features, better speed, and support for all hypervisors including Xen, Hyper-V and Virtual Iron. VControl is Vizioncore’s Web-based management console that supports VMware, Hyper-V and Xen hosts. It is a Windows application that uses open-source software including Apache, OpenDS and MySQL Enterprise, and consists of two components, a master server and a workflow server. VControl tries to replicate some of the functionality of vCenter Server for VMware environments, but unlike vCenter Server which requires an agent on each host, vControl is agentless and uses the VMware SDK instead. One really cool feature is the ability to emulate the High Availability (HA) feature of vCenter by setting a failover host and/or a disaster recovery host to be used in case of a host failure. Presumably the vControl server periodically polls the VM/host and, if it is unavailable, restarts the VM on the designated host. Action packs are available for ESX, vCenter, Hyper-V, Xen and Solaris that let you perform various virtual machine (VM) and host actions such as creating snapshots, entering/exiting maintenance mode, HA failover and so on. VControl has a nice, easy to use Web interface and is great for environments that do not have a vCenter Server or mixed hypervisor environments. While vControl is a free product, the workflow portion requires a license and enables you to use workflows to manage daily tasks and provision virtual machines. VControl supports both ESX and ESXi but will not work with the free edition of ESXi due to the limitations VMware has imposed on it with only having a read-only SDK. 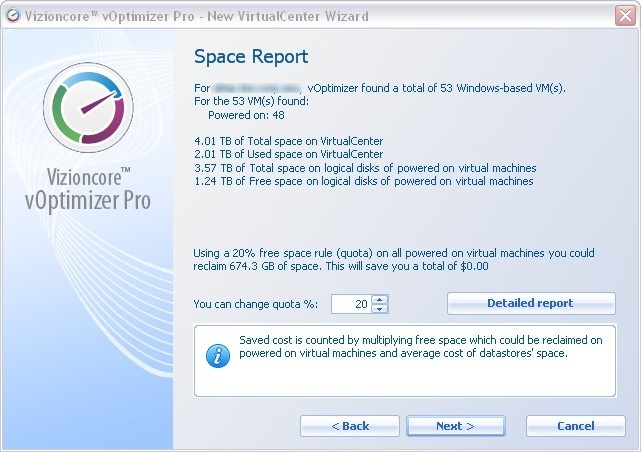 The final free tool is vOptimizer Wastefinder, which is basically the paid version of vOptimizer Pro with some features disabled. It is a reporting tool that reports on wasted disk space and also on virtual machine disk files are not properly aligned. 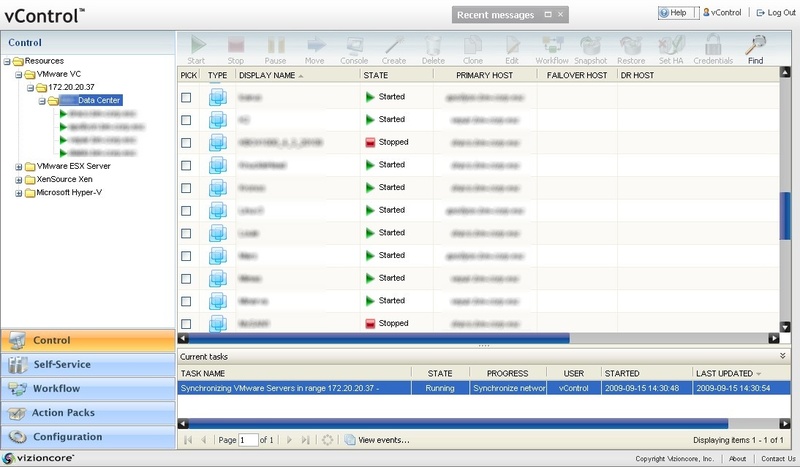 It can be installed on any Windows PC and connect to either vCenter Server or ESX hosts (no ESXi hosts are supported as this tool requires the service console). Even if you connect to a vCenter Server, however, root-level credentials for each ESX host are required as you need direct access to VMDK disk files. You can enter either a common username/password for each host or specify them individually. 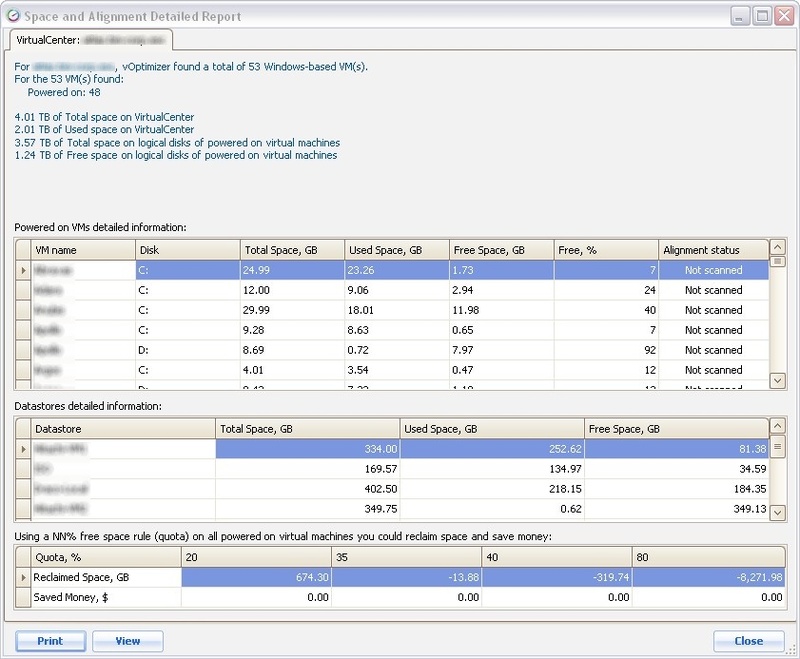 The optional disk alignment check is only for Window VMs and uses Windows Management Instrumentation. If you chose this option you must also specify OS credentials to log in to your VMs with. One cool feature is that you can specify a cost-per-unit value (i.e. MB/GB/TB) for each datastore so those that are on more expensive storage devices display a higher cost. The scan is fairly quick and produces a detailed report where you can see VM and data store disk usage statistics. Many of the features such as the ability to schedule jobs, reclaim disk space and realign partitions are disabled in the free version and require the full version. All in all, though, this is a nice little application that helps you stay on top of your disk space usage and find out where disk space is being wasted. There is one last free tool I want to mention. VESI, the Virtualization EcoShell Initiative leverages PowerShell to help manage and automate repetitive administration tasks and much more. You can read more about VESI here.